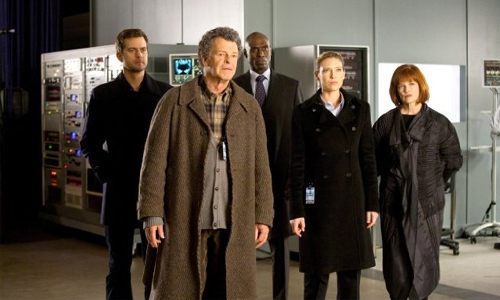 Cultural Wormhole: Fringe - "Reciprocity"
Joshua Jackson, John Noble, Lance Reddick, Anna Torv, and Blair Brown from 'Fringe'. Right off the bat, I've got to point out the huge fan service paid by the writers of 'Fringe'. For the past year, the Olivia from the alternate universe has been refereed to as "Bolivia" (as in Olivia B) over on FOX's official 'Fringe' website. However, Walter dubbed her as "Fauxlivia", which has become the nomenclature adopted by most fans and reviewers. It's official now. It pays to be loyal sometimes. This makes two episodes in a row that the creators on 'Fringe' have stuck solely the mythology, foregoing any Monster of the Week material. If you're a new viewer, than this would not have been the ideal episode to jump in on. That being said, the first two seasons are available on DVD and one could probably catch up with this current, amazing season through various means such as the FOX website, Hulu, or iTunes. Still, this continues to be an extremely gratifying season for those who've stuck with the show from the beginning. I was very happy how events unfolded up to the big reveal that Peter was the one executing the shapeshifters. While it was pretty evident that Dr. Falcon was a shapeshifter, I think this was distract from Peter's agenda and also throw some suspicion on Brandon. There was a point in the episode when I almost suspected Nina to be the mole within Massive Dynamic. I find the idea that not only does Peter effect the machine, but it, as Walter points has "weaponized" Peter. It has awaken a very dangerous and deadly side of Peter's personality that may have always been there. It'll be interesting to see how long Walter can keep this secret from Olivia and the others. Speaking of Olivia, I'm glad that the writers have decided not the drag out her anger at Peter for sleeping with Fauxlivia for too long. It's definitely the type of thread that could grow very tiresome if held onto for the rest of the season. Things are by no means back to normal between these two, but Olivia has had a little time to process what Peter went through, too. Also, having Fauxlivia's diary and reading how she felt about Peter, did shine a new light on the situation. I like that Broyles gave Astrid the task of combing Fauxilia's hard drive. This is more evidence that Astrid, though not as extreme, shares some intuitive pattern recognition skills with her Alt-Fringe conterpart. Plus, I like the character and I'd like to see her more than just everyone's sounding board, or Walter's babysitter. While the monkey brain formula and its effects on Walter were a bit goofy, I can't help but think the possibility of the scientist regaining his missing intellect was fascinating and a little scary. We've seen that Walter, with a fully restored mind can be a very strong-willed and sometimes cruel personality. Will our Walter become just as cold as Walternate?